Our competition this month is Bunting, and so I thought I'd create an article that might inspire you to go and create your own bunting and enter the competition. I've gather together some beautiful pictures, and great links, from around the web to get you started. Firstly, what is bunting? Originally, it just referred to a type of fabric, originally know as tammy. It's a lightweight worsted wool that would have been used to create signal flags for navy vessels. Nowadays, the little flags don't need to be made out of fabric to be called bunting, and they're not just used on ships. Indeed, they can be made out of any kind of fabric, card, or even paper, and are often used at parties and other celebrations. 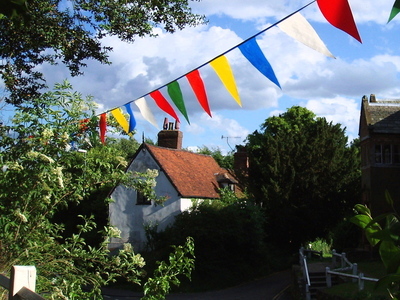 In the UK, the phrase, "bring out the bunting" is often used in reference to an event that would cause celebration in the whole country, harking back to the street parties at the end of World War 2, when whole streets were dressed up in Union Jack bunting. The tradition of using bunting might come from Royal Navy ships, who would hang all of their flags down the ropes when they returned port. You Are My Fave is one of my favourite sites for getting inspiration for projects. As a party planner, she is always coming up with new and interesting twists on old themes. The latest one is a cute floral bunting, with decoupaged flowers. Best of all, it's a no-sew project, perfect for those of us with tiny work-spaces and no sewing machines. Here's a handy video on Youtube which talks you through a step-by-step cardboard bunting creation. The Martha Stewart website is a reliable source of ideas for all sorts of projects. I've found a lovely tissue-paper bunting with a Mexican theme. Again, it's really easy to make, and you could adapt it to suit the colours and shapes that you like. And a quick search will yield exactly that. This is an easy project that will brighten up your house over Easter, and will also be easy and fun for children to participate it. I love the colours that she's used on this threaded Easter Egg bunting. I hope you find some ideas in there to inspire you to create your own bunting and share it with us on the site.